How can we not react to this latest brouhaha from Mocha Uson? 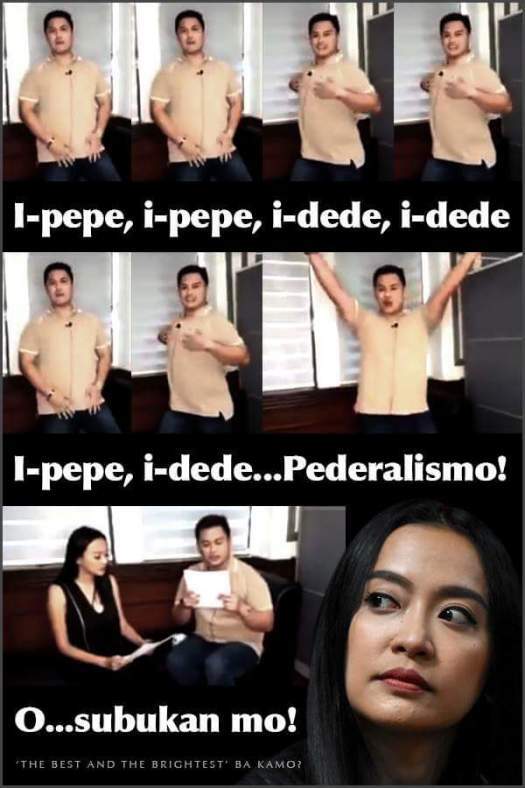 Federalism is a major issue in the Philippines. Major because people have this adverse feeling about it whenever it is proposed. There is the concern that it will lead to a monopoly of certain families of power in government – much worse than what we have now. So, when a plan is hatched to explain it to people, it must be dealt with carefully and cautiously. This video failed. It just makes fun of it. Sure, you want people to remember Pepe-Dede-ralismo, you got it. But what else will they remember? Just gyrating moves and people making fun of it. What about the salient points of Federalism that will affect all Filipinos? All lost because you are either laughing with them or at them. Or disgusted. Or all of the above. The slapstick, vulgar way they are used to doing things should not apply to policies that will affect the whole nation. Serious policies made shallow. Blessed Dedë Malaj: Martyred in the Albanian Communist anti–Christian persecutions. Much like the persecution our Priests are facing now in the country, Blessed Dede, pray for us. Bl. Bartholomew Longo: Vincente Pepe, a respected professor from his home town, convinced him to turn from the occult, and a Dominican friar named Father Albert guided him through his return to the Church in a process we would today call deprogramming. Longo finally recovered his senses and his faith, and became a Dominican tertiary on 25 March 1871, taking the name Fratel Rosario (Brother Rosary). And we need someone like Vincente Pepe who will give us good advice in turning away from the occult and the worldly needs, and go back to the Lord.